Steam is super heated to 180C and delivered at 10 Bar pressure, which makes easy work of the removal of the most stubborn, baked-on grease, oil and much more and yet it is completely environmentally-friendly. This 3 phase machine has 3 boilers, which generate 25kg of water per hour; for such a large machine the Gaiser 18000 is extremely compact and manoeuvrable. The unique continuous refilling function means that you can use the machine continuously without having to leave it to cool down when refilling. This machine has 3 x 6 litre boilers and a massive 25 litre refilling tank, making it ideal for long periods of use. This machine also has a 5 litre detergent tank, with an extra filler cap, from which either cleaning agents or mild sovents can be utilised in the cleaning process. A seperate detergent switch is provided on the mahcine, which controls the release of the chemical when it is needed for extra tough jobs. 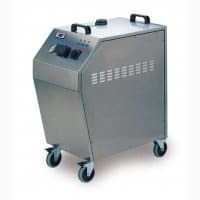 Within the food processing and printing industries, as well as heavy engineering, the Gaiser 18000 has all the power you need as either a portable or static-placed steam cleaner.